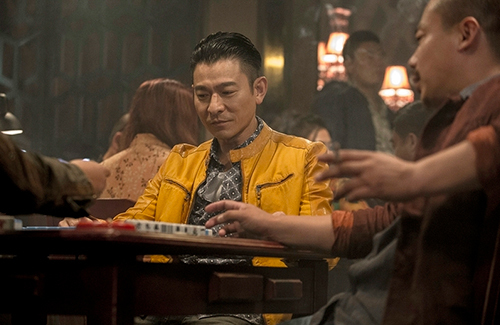 Andy Lau (劉德華) is a family man and a dedicated father. When he’s not busy acting in front of the camera, the 54-year-old celebrity dad would dedicate most of his time to his four-year-old daughter. Sources say that he would wake up as early as 3 in the morning to cook breakfast, and have Hanna be ready for school by 5. This is the complete opposite of Andy’s role in his upcoming action film The Bodyguard <特工爺爺>, which also stars Sammo Hung (洪金寶). In the movie, Andy plays a gamble-addict and an irresponsible father who often yells and beats his daughter. In the end, he runs away and leaves Sammo to care for her. Ironically, Andy’s own father reminded him of his role. Though Andy’s father was no where near as irresponsible and abusive as his character, his father often yelled at him and was very strict. “Yelling at kids do not equate to good communication,” said Andy. He shared that his father did not know how to communicate with his kids besides yelling at them. Although his father was a driving instructor, he never taught Andy how to drive because he would spend most of his energy yelling at Andy. Aggressive communication with children does not work. Andy expressed that if both the parents and their children fail to find a healthy and positive way to communicate, then everything the parents do would be considered as “wrong” in the eyes of their children. School by 5AM for a 4 yrs old? What kind of school is this to even open that early??!! Crazy!!! Yelling doesn’t always work but sometime it’s hard not to yell when they do not listen… being a parent is not easy. @bafabifi I mean even if they have an hour commute, what school opens at 6AM?!! Being 4 she is probably in preschool? 6:55AM! is still early. Here for preschool it’s like daycare and earliest I seen is 6:30AM. Kindergarten if it’s a public school, it’s half a day and it doesn’t start till 8:15 and over by 1PM! what porridge is he preparing at 3am? Well, Tbh, childcare centre at my place mostly opens before 7am. So that parents have time to drop them off early before going to work. @dramadrama Same here. Some work places have long work hours so there are childcare facilities that cater for those parents who have to go to work early. But those who start early in the day most probably will finish early afternoon since kids don’t have that much attention span to last for than 6-7 hours.